I know, it seems kind of mean. I’m a fan of the Sharks, I really am. 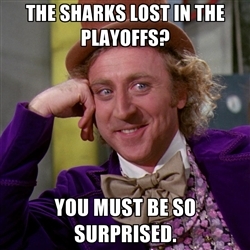 But come on, the Sharks were not up to it this season. I feel bad for Sharks fans. This team spent the last half-decade with an amazing window of opportunity. Marleau, Thornton, and usually at least a few strong supporting players, from Cheechoo to Couture. But this year? This team didn’t feel like a playoff team. I’m starting to think that the window has closed. For whatever reason, this team just wasn’t good this year, and I think it started in goal. Niemi was the worst goalie I’ve seen the Sharks have in a long time. The rest of the team wasn’t too impressive either, but it all starts in goal. Maybe they’ll do it next year, but I’m doubting it, to be honest. Sorry, Sharks. You’ve been teasing us for too long. Who’s The Next Melky For Giants Fans? How are the San Jose Sharks and the Titanic similar? They both look pretty good until they hit the ice.